Have you discovered NailOn with Holly and Mel yet? It is a Facebook Live broadcast the second Monday of every month on the NAILS Magazine Facebook page. It airs at 11 a.m. CST with co-hosts Holly Schippers (the FingerNailFixer) and Melissa Finch (Mel’s Tips of the Trade), industry BFF’s who love to share education and talk everything nails. This year, the broadcast will feature several special guests: January was CND’s Jan Arnold; April will be Famous Names’ Jim and Linda Nordstrom; and Tammy Taylor is in the fall lineup. Joining the broadcast live gives you the opportunity to share your ideas and opinions on the subjects at hand. Should you miss any, you can find them on the NAILS Facebook in addition to the NailOn YouTube channel. 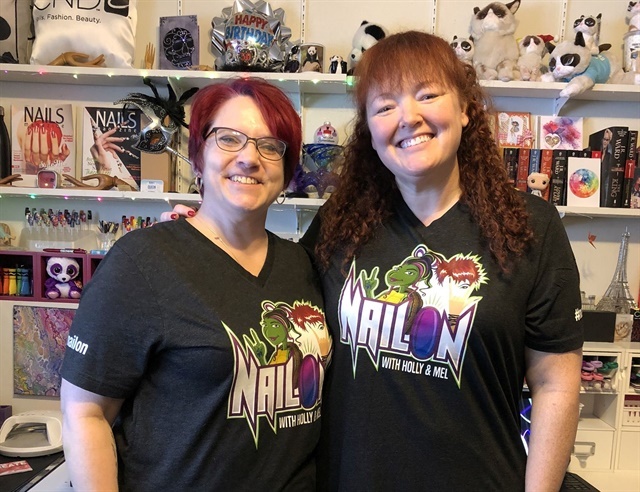 In our March broadcast on the 11th, we are celebrating the one-year anniversary of the NailOn with Holly and Mel broadcast! The topic will be how to get your work featured in NAILS Magazine. Celebrate with us and take notes on how to see yourself in print and on NAILS’ website!